By Catholics: The Holy Father's Happy 81st Birthday on his 8th trip! The Holy Father's Happy 81st Birthday on his 8th trip! The Holy Father celebrated his 81st birthday during his first apostolic journey to the United States. 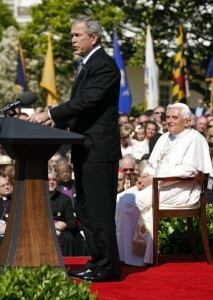 He had a full schedule that day, including an official welcoming ceremony on the South Lawn of the White House and a celebration of vespers (evening prayer) and a meeting with the bishops of the United States at the Basilica of the National Shrine of the Immaculate Conception, on the campus of The Catholic University of America in Northeast Washington, D.C.
Vatican City, Apr 14, 2008 / 01:14 pm CNA. The vice president of the Pontifical Commission for Latin America, Archbishop Octavo Ruiz Arenas, said that during his upcoming trip to the Unites States, Pope Benedict XVI will bring a message of hope to the faithful to encourage them to proclaim the Gospel of Christ with love and enthusiasm. Pope Benedict XVI said his April 15-20 visit to the United Nations and the United States was an opportunity to give -- and to receive -- a witness to the power of hope and faith. Reflecting on his trip during his April 30 weekly general audience, the pope said the hope that flows from faith in Christ can vanquish even the darkness cast by the Sept. 11, 2001, terrorist attacks.